In any season, spinach grows best when given rich, near-neutral soil that has been enriched with composted manure or other nitrogen source, and this is especially important when growing winter spinach, which will stay in the ground for up to seven months. Even when planting spinach after heavily-fertilised veggies like sweetcorn, I have found that spinach benefits from having its soil amended with a thick blanket of garden compost and a balanced organic fertiliser. 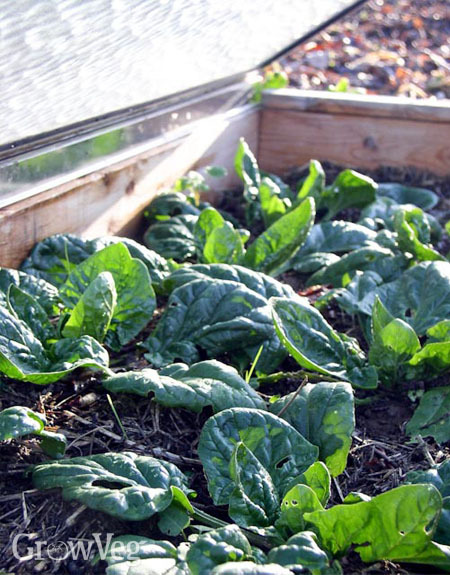 Several recent research projects in the US have found that winter spinach grown in a low tunnel covered with garden fleece grows just as well as spinach grown in greenhouses or high tunnels. In addition to moderating temperatures, low tunnels shelter winter spinach from ice and snow, and keep the leaves reasonably dry as well. I have experimented with many different setups, and have found that I prefer a glass-topped cold frame because it stays put in high winds, and never collapses due to heavy snow. Because winter spinach stays so close to the ground, it is never cramped by the top of the frame. Winter spinach commences vigorous new growth at a time when soil temperatures are so low that the availability of nitrogen is limited. To meet the plants’ nutritional needs it is important to provide a booster feeding with a water-soluble plant food as soon as new growth appears in late winter. In addition to preserving plant vigour, well fed spinach plants produce larger leaves.